San Diego County Explains 'Offending Words' In Fire Message : The Two-Way Fire officials hope they've seen the worst of a fire that has burned 1,550 acres. They also say they'll get to the bottom of a message in an alert stating, "fire in your pants." 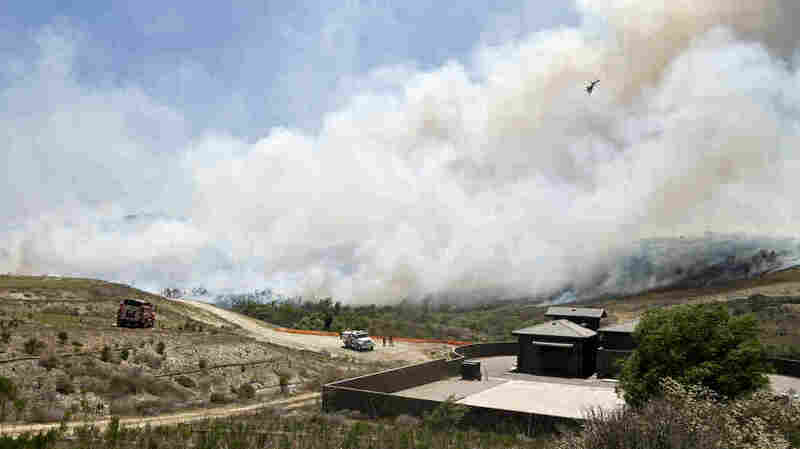 Fire officials in San Diego are hoping they've seen the worst of a wildfire that has burned 1,550 acres. They also say they'll get to the bottom of an odd message in an alert that stated, "fire in your pants." The blaze caused evacuation calls to go out to residents, schools and businesses in an exclusive area of San Diego County. No injuries or structural damage has been reported so far. Late Tuesday, officials acknowledged confusion over how many evacuation notices had gone out, clarifying that an earlier report of 20,000 homes being evacuated was incorrect, according to member station KPBS of San Diego. Instead, that number seems to reflect the number of alerts that went out. All evacuation alerts for the area were lifted Tuesday evening. And San Diego Fire-Rescue now says the blaze, called the Bernardo Fire, was 25 percent contained as of Wednesday morning. The agency fixed the problem by republishing with the correct data, according to NBC News 7 in San Diego, which says it also "closed a 'portal' into the system that the culprit used to gain entry." Local ABC 10 News says it was told that "the county worked on it on the cloud 'but someone left the door open.' "
As is often the case with the Internet, the fix didn't happen fast enough to keep people from taking a screen shot of the erroneous message from the county's geographic information system. Images soon appeared on Twitter. As for the actual brush fire, the effort to contain the blaze continued Wednesday. The smoke and ash from the wildfire were thick enough to appear on weather radar, as NBC News 7's Jodi Kodesh captured in a tweet. "You can't really talk about 'fire season' anymore," San Diego Fire Department spokesman Lee Swanson tells Wagner. "It's year-round." Wagner adds that "a 'red flag' warning issued by the National Weather Service remains in effect through Wednesday." Smoke rises from a canyon in San Diego where a wildfire raged on Tuesday. County officials say they're investigating how a rogue message appeared in their emergency app.